In the late 1980s and early 1990s Ron Gilbert and Gary Winnick made their names in the video game industry with games like Maniac Mansion and The Secret of Monkey Island. At the end of 2014 Ron Gilbert and Gary Winnick decided to team up and make a totally new point and click adventure game named Thimbleweed Park. They held a Kickstarter campaign which raised over $600,000. A little over two years later and Thimbleweed Park was released today. While Thimbleweed Park is not perfect, it does a great job of bringing classic point and click adventure games to the modern era. Thimbleweed Park begins in a small town, bearing the same name as the game, where a dead body has turned up under the bridge. Agent Ray and Junior Agent Reyes arrive in town to investigate the murder. As they investigate the murder they discover that Thimbleweed Park hides some dark secrets. To uncover the secrets of Thimbleweed Park you will play as five different characters that must work together to solve the mystery behind the town. Agent Ray is not whom she pretends to be and may have mysterious ulterior motives for why she is in town. Junior Agent Reyes seems to be oddly obsessed with a factory fire from 20 years ago. Franklin the ghost is trying to find a way to reconnect with his daughter. Ransome the Clown is trying to be a better person after his actions led him to becoming cursed. Finally Delores the video game designer has to decide between following her dreams and taking over her family’s business. Will this group of strangers be able to uncover the mysterious of Thimbleweed Park before it is too late? 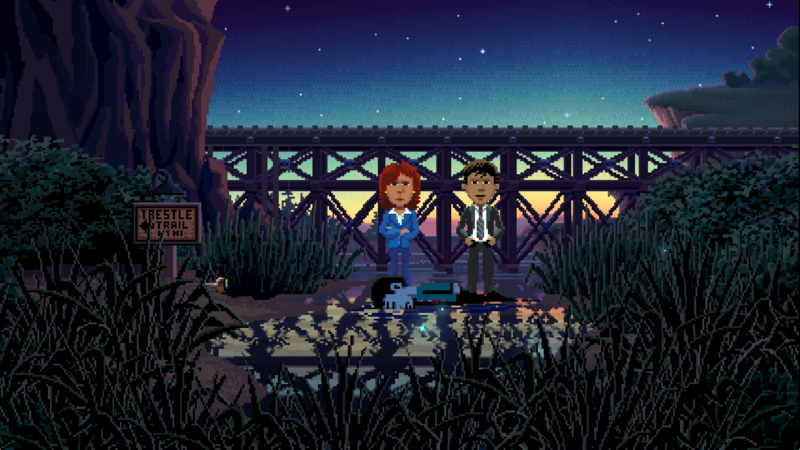 While Thimbleweed Park’s story has nothing to do with Maniac Mansion or The Secret of Monkey Island (outside of some inside jokes), I would still consider Thimbleweed Park to be a spiritual successor to the early days of point and click adventure games. This inspiration is immediately recognizable. While most point and click games today have ditched the interface used in the earliest point and click games, Thimbleweed Park keeps the interface. Along the bottom of the screen is a list of actions that you can perform in the game. While the game will have two default actions for everything you encounter in the game (linked to both mouse buttons for easy access), you will regularly have to use this interface to perform different actions with items and the environment. Having never played Maniac Mansion or The Secret of Money Island I didn’t know exactly what to make of Thimbleweed Park when I first started playing it. While it might look different than your typical point and click game, for the most part Thimbleweed Park plays like most modern point and click games. You pick up items, explore the environment, combine items, talk with people, and use items with the environment to progress the plot. If you have played a point and click game before you should know what to expect out of the game. Outside of possibly the story, the puzzle design is the most important thing for point and click games. While the puzzles are on the easy side, the puzzle design in Thimbleweed Park is very good. While I haven’t played a lot of the older point and click games, at times they used nonsensical puzzles where you had to basically try every object in every combination until you came upon the solution. Here is one area where Thimbleweed Park really differentiates itself from the older point and click games. Thimbleweed Park doesn’t have any of these puzzles with nonsensical solutions. Instead the game finds clever ways to use the items and the environment for puzzles that might not always be obvious but make sense. There are no puzzles where you are left wondering what the designers were thinking. The puzzles in Thumbleweed Park are pretty straightforward where if you take your time you shouldn’t struggle figuring out how to solve them. Before starting the game Thimbleweed Park gives you a choice of difficulty between casual and hard mode. To test out the two difficulties I started with the casual difficulty and then went through the hard difficulty to check out the puzzles not included in casual mode. The two modes are very similar as the story doesn’t change outside of the extra puzzles you have to solve to get through the hard mode. The main difference between the two modes is that while the casual mode gives you quite a few of the items you need for a lot of the puzzles, the hard mode takes you through a couple steps to get those items. This basically means that both modes take you through the same journey but the hard mode has more stops along the way. Unless you don’t play many point and click games I would recommend just starting with the hard difficulty. The first reason is that the casual mode cuts out basically all of the puzzles that have any challenge. Outside of possibly not finding some of the items that you need, you can breeze through the casual difficulty. The hard mode is a little more difficult but I can’t see it being too difficult that you will get stuck for too long. The only part where I got stuck in hard mode was when I couldn’t find a hidden item that I needed for a puzzle. Other than the increased difficulty I would recommend the hard mode since the casual mode has some small areas where the game feels like it jumps past part of the story. This feeling comes form the puzzles being eliminated which add small little parts to the story. These small missing parts don’t ruin the story but it still kind of feels like you are missing something. Even though the hard difficulty is harder than the casual mode, I would still not consider Thimbleweed Park to be an overly difficult game. I wouldn’t consider the game to be easy either but if you have played a lot of point and click games you probably aren’t going to be stumped by most of the puzzles. I attribute this to most of the puzzles being straightforward. This eliminates the frustrating puzzles which make no sense but also makes a lot of the puzzles pretty easy to solve. While the puzzles take thought to figure out, you can get a pretty good idea of what you have to do for most of the puzzles when they are presented to you. I wish the puzzles were a little more difficult but I would take straightforward slightly easy puzzles over frustrating puzzles any day. After the puzzle design I think the most important part of a point and click game is the story. For the most part I really enjoyed the story of Thimbleweed Park. The game’s story has a couple slow points but is in general quite good. In particular I really liked the “twist ending” which I won’t talk about to avoid spoilers. I really don’t want to talk too much about the story in order to avoid spoiling the game for other players. I will say though that I don’t see many people not wanting to see how the story ends. While I didn’t find all of the jokes to be funny, there are still quite a few laughs in the game. I would say that most of the humor in the game comes from making fun of the late 1980s, geek culture, game design, and the point and click genre. While I wouldn’t call Thimbleweed Park laugh out loud funny, I did get quite a few laughs out of the game. The game’s length is adequate for a point and click game. The casual difficulty is obviously going to take less time than the hard difficulty. I would guess that most people could complete the casual difficulty in 6-9 hours. The hard difficulty will probably take most players 8-12 hours. Being a point and click game there is not a lot of replay value in the game unless you want to revisit the story. Basically Thumbleweed Park is what you would expect it to be: a good point and click adventure game. The game’s puzzle design is quite good. The puzzles are a little on the easy side but they avoid being frustrating and are satisfying to solve. The story for the most part is quite good and there is quite a few laughs to be had. This is probably going to sound obvious but if you don’t like point and click adventure games I don’t see you enjoying Thimbleweed Park. If you like a good point and click adventure game though I think you will really enjoy Thimbleweed Park. A strong funny story with a good ending. Good puzzle design that avoids frustrating puzzles. The puzzles are a little on the easy side. The story hits a couple slow points.